Glass, mosaic murals inspired by the Manhattan Beach Pier at sunset and the Round House Aquarium at the end of the pier were unveiled last Wednesday evening on the walls of the newly expanded and remodeled Skechers flagship store, at the corner of Manhattan Beach Boulevard and Manhattan Avenue. 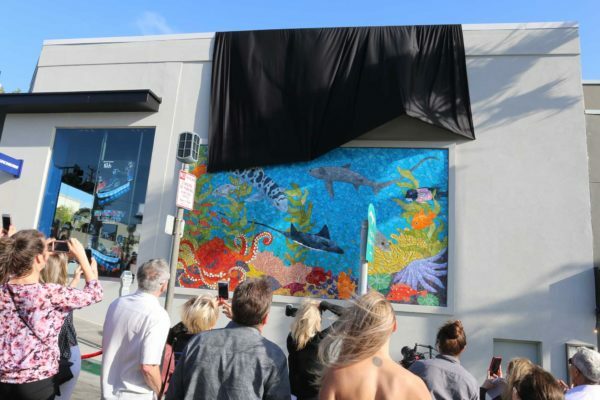 Manhattan Beach residents and business owners celebrate the unveiling of a mosaic mural on the side of the downtown Skechers. 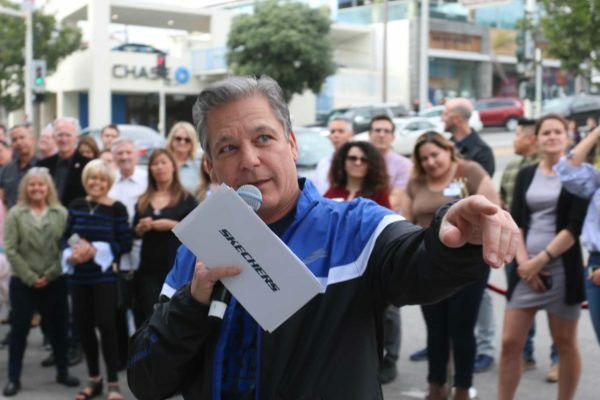 “This is Skechers’ gift to Manhattan Beach’s public arts program,” Skechers CEO Michael Greenberg said at the mural unveilings. The Manhattan Beach city council recently announced a new public arts initiative, to be funded by nearly $1 million from development permits. The murals were designed by Rachel Rodi, an instructor at the Institute of Mosaic Art in Berkeley. She said the two murals required a crew of 14 glass cutters and over 2,000 work hour to complete.